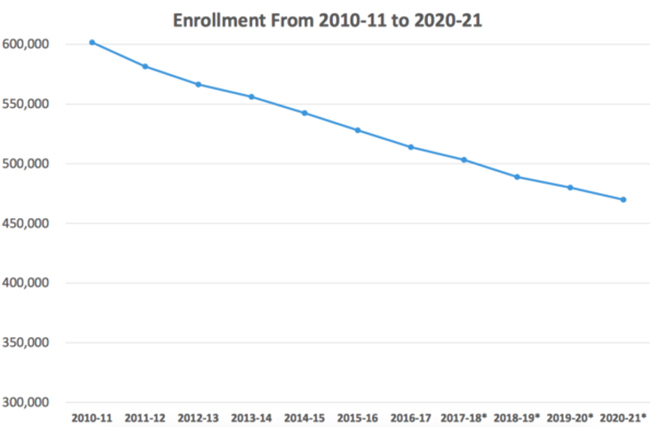 While the district tries to satiate the teachers union’s demands, it’s teetering on a proverbial “fiscal cliff” — shouldering more than $15 billion in future retiree health benefits, rising pension costs, and rapidly declining enrollment. Its reserves are projected to be nearly depleted by 2020-21. This latest funding blow from the strike is likely to shrink the pot of money available for paying off debt and for reaching a settlement that would end the now weeklong walkout. Attendance levels in the 486,000-student district have been more than 60 percent below normal levels each day. The number of students in class every day dictates the amount of state funding California school districts get. L.A. Unified receives $68 per day per student. ● Monday: 156,774 students present. A $22.8 million loss to the district. ● Tuesday: 171,480 students present. A $21.7 million loss to the district. ● Wednesday: 134,724 students present. A $24.4 million loss to the district. ● Thursday: 84,160 students present. A $28.2 million loss to the district. ● Friday: 85,274 students present. A $28.1 million loss to the district. L.A. Unified’s offer currently on the table to lower class sizes and hire almost 1,200 new staff, including educators, nurses, counselors, and librarians. This does not include salary. The latest proposal to limit class sizes and add staff is $40 million above the high end of what a neutral, state-appointed fact-finder recommended in December. Read more. The reserve this past year was nearly $2 billion. The district, however, says the bulk of that money has already been earmarked for costs such as federal and state-required programs for low-income students, anticipated teacher pay raises, and more staff hires. The county already sent fiscal experts to the district this week and could install a fiscal adviser with the power to rewrite budgets, overturn school board decisions, and invalidate upcoming labor deals if an agreement with UTLA lurches reserve levels further in the red. Read more. Erasing that debt would take $4,180 from every man, woman, and child in the district, according to an L.A. Daily News op-ed by state Sen. John Moorlach. Read more. Projected retiree benefit spending for 2018-19 alone. The district offers free, lifetime benefits for retirees, employees, and their dependents — a generous perk few workers get. ● The total cost of the district’s promises to provide future retiree health benefits is $15.2 billion. ● The annual cost of retiree benefits equates to $12,500 in district spending per teacher, says Chad Aldeman, a senior associate partner at Bellwether Education Partners. ● $2,300 of the roughly $16,000 L.A. Unified received per student for 2018-19 goes toward funding the district’s health care package. Read more. ● Employee benefit spending spiked 138 percent between 2001 and 2016. ● Health care benefits, along with rising employer pension contribution rates, are expected to consume half of district spending by 2031-32. Read more. 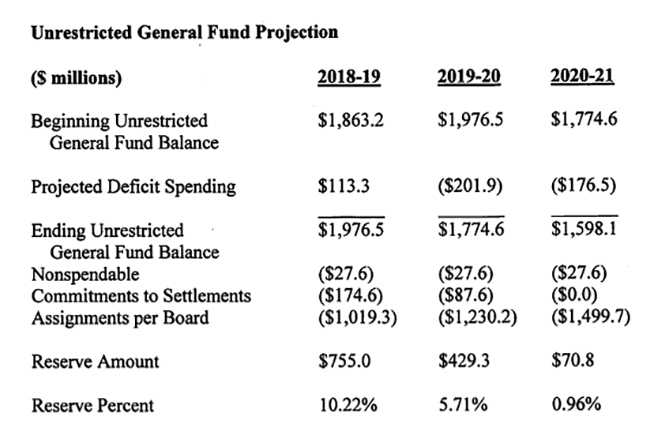 How much UTLA’s current demands would add to annual district spending, Beutner said this week. 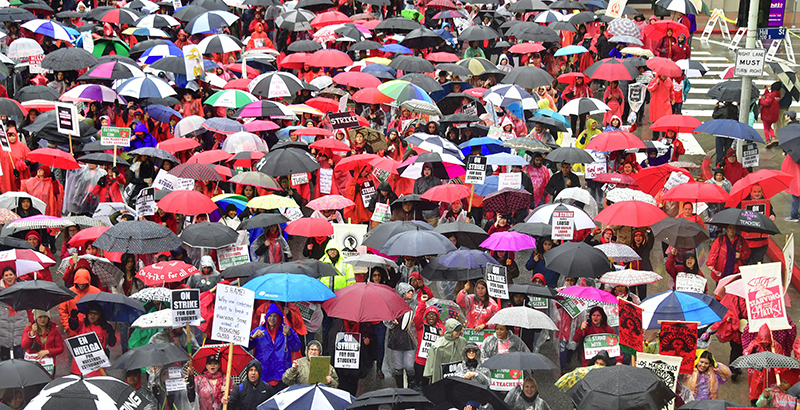 UTLA contract demands include a full-time nurse in each of the district’s 1,100 schools, smaller caseloads for special education teachers, and a 6.5 percent pay raise retroactive to 2016-17. L.A. Unified is also losing millions as at least 12,000 students leave the district annually. While charter school growth plays a role — about 35 percent of students who leave the district are going to charters, according to a Reason Foundation study — the decline is attributable as well to lower birth rates, dropouts, and transfers out of the district. Read more.